About yesterday, when I was on TV and when I went midnight skinny-dipping with two ladies. And about today, as I travelled a long way up north to Hervey Bay, where I met Peter Deveraux. I also noticed the red ribbon assortment he had and asked him if he was a big supporter of Aids Awareness. He then told me his story. I owe you something about yesterday, a day I spent writing the Steve Irwin report of last Friday -- and from now on I'll try to refrain from mentioning him again. The day was over before I knew it. When I came back to my dorm room I crashed into the British roommates Sarah and Lisa, who had to be at least better than the two French guys who kept me awake with their snoring, the first night in the Halse Lodge. The ladies are going to spend one month in Australia, and hurry their way up through the country, all the way to Perth and then they'll fly up to Thailand to finish the money. Yesterday was also the day that the Channel 9-report about last Friday was broadcast on national television. At 6.45pm I was clustered to the television that hangs outside on the veranda. When the Steve Irwin report was on, everybody was amazed. First because they saw him feeding this dangerous and attacking crock, and secondly because suddenly I was in the picture with a giant python on my shoulder (saying: "I think she's going between my legs" and the camera followed that snake trying to squeeze me down there). The report was a good publicity opportunity for Stevo's Zoo and his upcoming movie, and it was fine with me that my website got mentioned and I was in the item for exactly 20 seconds. That this had to take such a long day with a film crew is my question too. I could have seen much more of the zoo if they would have told me they only needed 20 seconds of me. After dinner in the bar with barman Matt, I met up with Nicky and Laura, two 19-year-old British girls. I mean, it's full with British backpackers in Australia! We spent the night drinking beers and wines and when the bar closed and the lights were shut off at 1am, we were almost obligated to get to our dorms. But no, Laura told us how willing she was to go skinny-dipping for the first time in her life! Tonight! Haha, skinny-dipping! That basically meant going swimming without any clothes on. And she didn't want to go along. For Nicky and me it was quite a laugh (we both did it before, she in cold England and me in South Africa and Spain). And because we didn't allow her to go all alone, we just had to join her. The entire town of Noosa could have seen us strip on that moonlit beach and jump for those waves. And it was thrilling! It's something everybody should have done in its live at least once! We splashed around like Adam and Eves and had a good time! While we air dried ourselves on the beach again, we smoked a ciggie before heading back to the hostel. I just knew I'd sleep well last night. This was a fascinating experience. Here I am, back to today! When I woke up reborn again, around 8 in the morning, I just wasn't sleepy anymore. You see how refreshing a midnight dip can be? Today I'd have to leave the hostel and head up to my next destination in well-known Hervey Bay, a few hours by car up north. But I had no car and had to hitchhike again. Good! I said goodbye to some of the travellers I met in the hostel and thanked the ladies at the reception. As I prepared my hitchhiking sign with the words 'Hervey Bay' on it, Sue, the lady from the kitchen sneaked me some sandwiches and fruit for on the road in my bag. That was very nice of her. I walked my way through Noosa and had to head up north to get out of town. I never expected to get a lift in Noosa, but suddenly one man pulled over. "I passed you a few seconds ago and I thought, tomorrow is Anzac Day and everybody remembers the good things veterans have done for our nation, so why not take you along?" Anzac Day is held on 25 April each year to commemorate Australians and New Zealanders killed in war and to honour returned servicemen and women. The ceremony itself has been continually adapted to the times, but has also steadily acquired extra layers of symbolism and meaning. The man wasn't going very far, but at least far enough to drop me on the main road going north. I thanked him for his goodwill and started hitching. The second person taking me along was a full-body pierced and tattooed (as far as I could see) man with long blond dreadlocks, driving a classic VW-van. He lives in Gympie, a town about which I heard various stories about. As with many towns that began in the 1800s, Gympie was originally settled as the outcome of a gold rush. In 1867 James Nash was prospecting in the area when he found 2.7kg of gold in six days. Nash's discovery began a gold rush that quickly led to the development of Gympie. Discovered in Gympie, the famous Curtis Nugget, which weighed 37kg, was the largest ever single nugget found in Queensland. Of all the forms taken by gold, nuggets generate the greatest excitement and, at times, the most discussion. The area was profitable for many years, and although the gold fields peaked in 1903-reef mining continued until the 1920s. Of course this gold rush lead many people to this town, in their search for fortune. Families did not mingle and some strange people came out if this, like the story I heard about the double-headed people. Next to a lot of people living in trailers, the crime was very upgraded to and Gympie got its nickname as Helltown. If you were going to Gympie, you were going to hell! The friendly driver dropped me off in Gympie and it didn't look like hell at all, not as I would imagine it. There was a McDonald's and the main streets was speckled with historical buildings. I didn't have much time to wander around here, and I hitchhiked my way up north again. I was only halfway to Hervey Bay now. A quiet man with a pickup truck took me along to the exit to Hervey Bay. He talked in a sense that nothing interested him but did ask me to tell my story. No real 'Ooh' or 'Aah', but just a simple 'Is that so?' was his response. Then he started talking about his former business in Thailand and how things are so cheap there and he still worries about so much child prostitution there. "It's illegal now, but the foreigners who know their way around there for the last ten years still know where they can find little girls and boys." That was quite a conversation topic and I had to endure quite a change of mind when he dropped me off in the hot autumn sun, just 40km away from Hervey Bay. Almost an hour later two young ladies pulled over and took me along. Their first question was: "Are you going to kill us?" and then I showed them the back of my sign, which still says "I don't kill". "All right, get on in! Our mother would kill us if she knew that we took along a hitchhiker" one of them said and Bon Jovi blasted out of the speakers. They dropped me off just outside of Maryborough, a small industry town and popular retirement haven. One more ride and I arrived at my destination, the afternoon was close to its end and another man took me along and dropped me on the Esplanade (beach road) of Hervey Bay. Five small sleepy beachside towns experienced explosive tourist growth and have merged into the one large town of Hervey Bay. On the old map of this coastline, Hervey Bay is not even mentioned! The other big attraction, next to the nearby Fraser Island here is whale watching, as the humpback whales breed here between August and October. 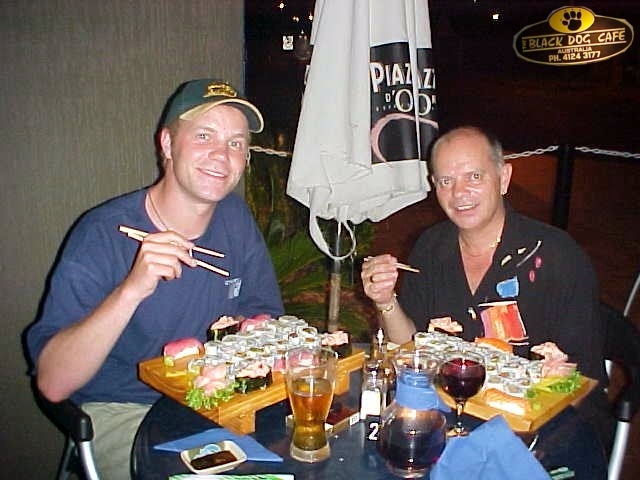 I contacted my host in this town and within ten minutes I was introduced with Peter Deveraux. Peter had seen me on A Current Affair when I just arrived in Australia and was simply amazed. "I thought, if you have the guts to travel around the world, depending on people without money and only with a backpack, a phone and a laptop, I should have the guts to invite you!" And that was a very clear statement. Peter took me along to his home near the town centre, where I was welcomed by Barbra Streisand. She smiled at me from all possible directions. It was obvious that I just arrived at the biggest Streisand collection in Australia. Peter poured me a coke in a mug and not just a mug, but a real Letmestayforaday-mug! "Oh yes," Peter said, "I visited your website and saw there was a shop, so I first went there to see what you had to offer. And then I clicked here and there� Look," and he got something from another room, "I even bought these!" He showed me a Letmestayforaday-t-shirt and Letmestayforaday-boxer short. "It was just such a great idea to make these, I couldn't resist ordering them. I told him about how the profits from the shop go to charity, like how the profits of the Letmestayforaday-Christmas-teddy bears went to the South African Aids Foundation. "Yes, it should!" he stated, "It's all very expensive!" I shouldn't make a secret of Peter's homosexuality, as he was very open about it to me. Barbra Streisand was just a cover-up, haha. His house is like a museum, not only because of this singer/actress, but Peter seems to love collecting things. From fridge magnets (I lost counting), LP records, videos, CD's and since lately, DVD's. And I must say, he has a good taste! His story about his life partner Mike who found out he had the HIV-virus in the 80's. It took a long time before he got really sick and he died of AIDS-related body disturbances in '97. It was quite an emotional story to hear from him. He was dead calm while telling it, but it really struck me. I myself had a friend who died of AIDS; I even went to school with him when I was young. Before heading out for dinner, I had a little nap. It had already been a long day with a long distance and a lot of people. 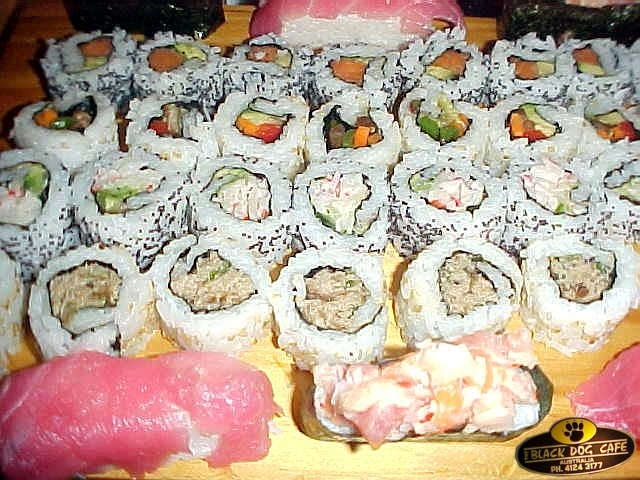 For dinner, Peter took me out to the local Japanese Black Dog Caf� where he ordered two platters with sushi! He read that sushi is my one of my favourite foods! We sat outside on the terrace, enjoying this great fish Japanese food, and talked a lot. About politics, travelling, the world, our society, etcetera. Back home I was honoured to select one of his DVD's and we watched the Oscar-winning Training Day feature while enjoying self-made coffee-ice cream. It was after midnight when Peter was snoozing away on the couch and I connected myself on the Internet to report about previous days. Tomorrow I had to wake up early, because Peter had arranged a little present for me!